Nutrient disinfection is essential for the prevention of diseases in hydroponically grown plants. Unlike soil grown plants, hydroponically grown plants do not enjoy a protective root cover and the nutrient solution is continuously exposed to the atmosphere. 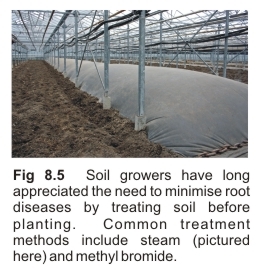 This allows the free access of fungi such as pythium, phytophthora and fusarium (Fig 8.6). Unfortunately, these diseases spread readily when excess water is present and as a preventative strategy, the nutrient solution needs to be regularly disinfected. There are a variety of disinfectants available for hydroponic systems. “Oxidizing agents” have historically been most popular. Unlike alternative methods their mode of attack ensures diseases will not develop resistance. Oxidizing agents are also non systemic which means it does not enter the plant. This enables disinfection treatment to continue throughout the fruiting period without causing potential harm to the consumer. This feature complies with ‘organic' farming guidelines that prohibit the use of systemic chemicals. properties that determine whether or not the oxidizing agent can operate as a “broad spectrum” disinfectant throughout the system. Note that a broad spectrum disinfectant is required in hydroponics because of the variety of fungi encountered. As shown below, monochloramine is most suitable. ‘Half-life’ duration: A long half-life means that when the disinfectant is in the nutrient solution it remains chemically active for a longer period of time. This ensures the entire system (root zone, plumbing, etc) is treated each time the nutrient pump is turned on. 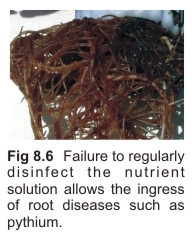 Without a sufficiently long half-life the disinfecting chemical becomes inactive before it can reach the root zone. This is a deficiency with ozone and UV. They only disinfect nutrient at the site of application. Further, they can also destroy chelated trace elements (e.g. iron EDTA, iron EDDHA). Monochloramine has the longest half-life of all the oxidizing agents. This is one of the reasons for its wide-spread use in disinfecting town water supplies, especially where water is being pumped down long pipelines. Although chlorine dioxide and sodium hypochlorite are widely used for disinfecting town water supplies, their relatively short half-life restricts their use to smaller town circuits where a shorter half-life is tolerable. Oxidation potential: This is the measure of an oxidizing agent’s power or ability to kill fungi and other organic organisms such as algae and slimes. Sufficient oxidation potential also helps eradicate food sources that are responsible for attracting fungus gnat and other root zone pests. 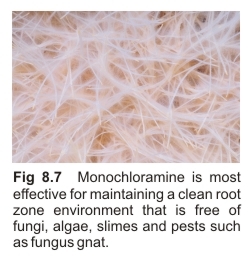 Although monochloramine, chlorine dioxide and sodium hypochlorite have sufficient oxidation potential for the above mentioned tasks, only monochloramine is ‘gentle’ enough for hydroponics. Chlorine dioxide and sodium hypochlorite can cause harm to roots, 'organic' mediums and organic growth promotants. At the other end of the spectrum, peroxide is too weak for hydroponics. It only becomes a strong oxidizing agent at pH’s below ~2, which is too low for plant growth.